Want freedom from Data Entry for accounting in WooCommerce QuickBooks Online? Integrate your WooCommerce Store to QuickBooks Online today with WooCommerce QuickBooks Connector Pro. WooCommerce Quickbooks Connector Pro plugin provides automated integration between WooCommerce Store & Quickbooks Online. This plugin will help in account management of WooCommerce store through QuickBooks Online. This will also provide automated syncing of unlimited products, customers and orders of WooCommerce store to QuickBooks Online. After installing the plugin, syncing will be automated so you don’t need to create data in QuickBooks manually so you don’t need to do more data entry for creating or updating products, orders & customers in QuickBooks Online. 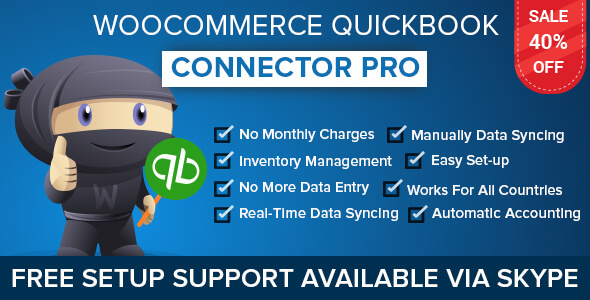 WooCommerce QuickBooks Connector Pro connect WooCommerce & QuickBooks Online so you can Sync inventory updates from WooCommerce store to your QuickBooks in second. For automating your work WooCommerce Quickbooks Connector Pro provides Real-Time Orders, Products & Customers Sync so Connect QuickBooks Online and WooCommerce to automate your work. Update your products, customers & orders from WordPress admin and it gets updated at QuickBooks Online and if you updated your products, orders & customers in QuickBooks Online then its also updated in WooCommerce Store. If you want to sync selected product then you can manually Push & Pull data for syncing selected Products, Customers and Orders. WooCommerce Order Coupon Pro comes with lifetime solution with the one-time investment so sync Unlimited Orders, Products & Customers without Monthly Fees. For sync your products, customer & order. you only need to setup a few things that you can set very easily. It works for all countries including USA, CANADA, AUSTRALIA, UK, Spain and INDIA. Thank-you for showing your interest in WooCommerce QuickBooks Connector Pro, RedefiningTheWeb.